In today’s digital world, the likes of Instagram and Messenger are hot trends. 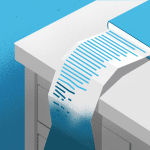 It’s tempting to see email as the old workhorse. Dependable, but slowly losing that revolutionary spark when it took off 20 years ago. But this assumption is wrong. The fact is email is becoming more popular than ever, with 269 billion emails being sent each day in 2017. That’s right. 269 billion. A day. If this figure distributed evenly across the world’s internet users, it would mean the average user would send 76 emails a day. Eye-watering figures.At $44 for every $1 spent, emails also generate the best return-on-investment out of any digital marketing channel. To make the most of email marketing for your business, you need to come up with a strategy and an email funnel should be at the heart of it. 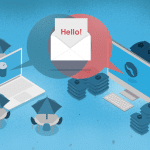 The email funnel follows the same concept, from attracting potential customers to subscribe and turning engaged subscribers into loyal advocates for your brand. This funnel could be applied to both general marketing and email. It helps you to focus on building a relationship with your most promising subscribers. The funnel-shaped structure of this model perfectly illustrates the overall process. In the beginning, it’s about generating awareness of your brand to a large audience. As much as you can try, you will never get them all to consider and then subscribe to your emails. Even when you convince potential customers to sign up, some subscribers will become disengaged. By the end of the process, you will have a group of loyal advocates you will be able to work with. 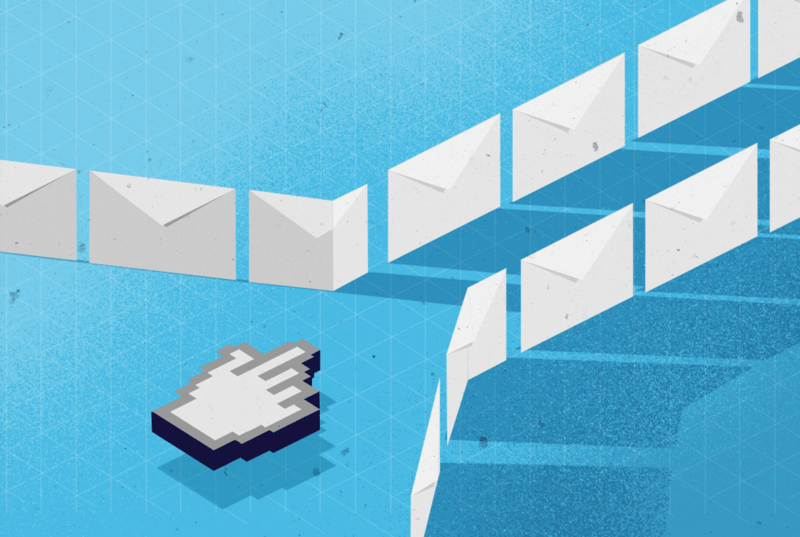 The email funnel helps you to streamline, understand, and target those advocates at the earliest possible stage. Social Media – With over 2.4 billion active users on the major platforms, social media is a powerful weapon in your armory. Search Engine Optimization (SEO) – This is the long-term game. Ensure you follow best practices and avoid taking shortcuts which could lead to penalties. Do it right, and you will start appearing on the first page of Google’s search results. 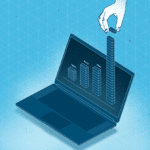 Paid advertising – Focus on digital advertising. 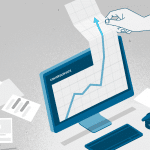 They are easier to track and monitor, which will enable you to make the most of your budget. Content marketing – Creating and distributing high-quality content will help to build your brand as a thought-leader. 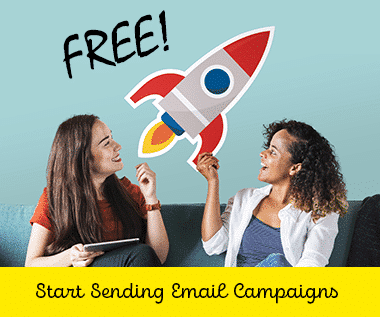 This will drive people to your business and signup for your emails. Website – Your website is critical for awareness. Make it easy for site visitors to find out more information and understand the benefits of subscribing. This signup form from Etsy is an excellent example of a brand raising awareness about its emails. By giving a brief description of each category, together with the frequency of send – the would-be subscriber has complete control. The additional contact details and information on the right-hand side of the page gives subscribers another layer of reassurance. 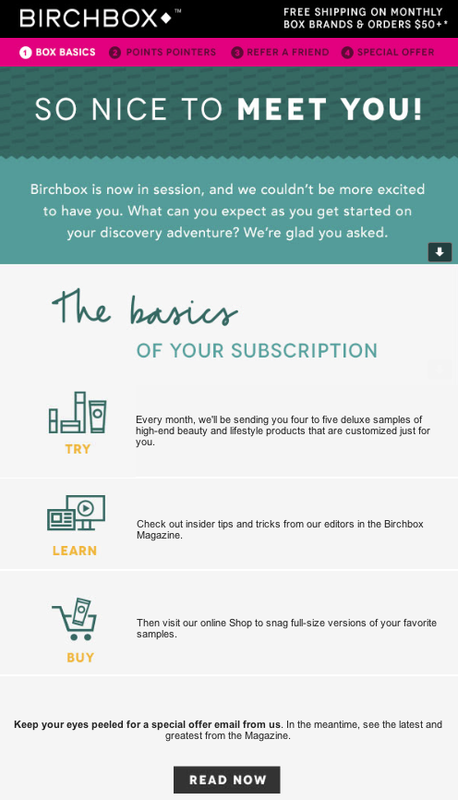 This welcome email from Birchbox simply says thank you for signing up and shares the benefits of the subscription. Still, in the awareness stage, you want to be making your new subscribers feel comfortable with your brand. The key is not to overwhelm them with too many specifics at the start of the new relationship. The focus should be on informing and educating your subscribers about your brand and what it does. Avoid simply promoting your products and share useful content like your blog posts to engage with your email list. A successful welcome series should lead to the consideration stage. Here, you can step up the game a little bit.Move away from the generic brand emails and start talking about the products you sell. Identify pain points and address how your products can help resolve them. Note that the onus should still be on education rather than aggressive over-selling.You could also share more specific content. For example, if you’re an estate agent, you might want to consider a five-day drip campaign, guiding subscribers through the house selling process. 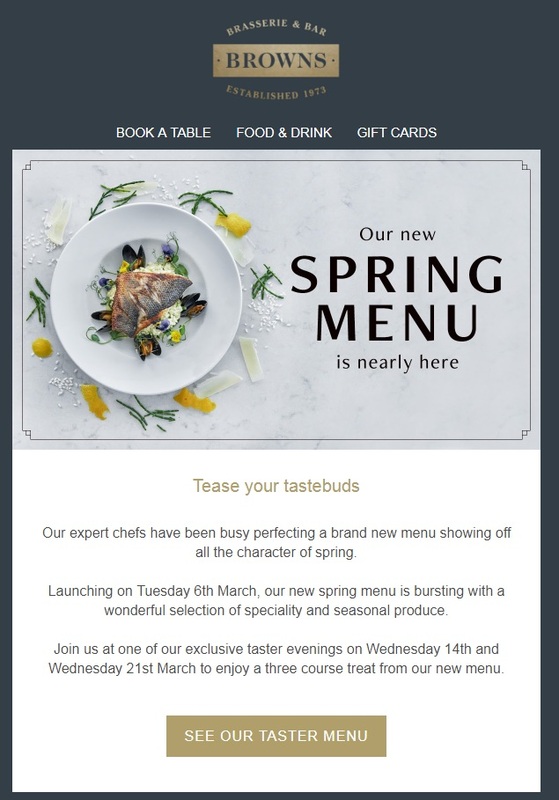 The email leads in with an enticing image of a fresh new dish. The tagline “Tease Your Tastebuds” is direct and engaging. The brand knows its subscribers are interested in food, and so the format presses all the right buttons. The content is minimal and the call-to-action (CTA) tab is clear. There’s no doubting what the purpose of the email is, yet it’s not pushy or overselling. It’s letting the menu sell itself. This is the perfect email for the consideration stage. It’s specific, encouraging, and displays what the brand is about. Any serious subscriber would not be able to resist pressing the CTA. By monitoring the performance of your emails, you should be able to work out which subscribers are engaged with your brand. Now is the time to target those who have been opening your emails and clicking through to read your content. They know you, trust you, and want to hear more from you. The stage is set. Promote your products and offer incentives to get them to buy. This could include special offers, deadlines, or even free previews. 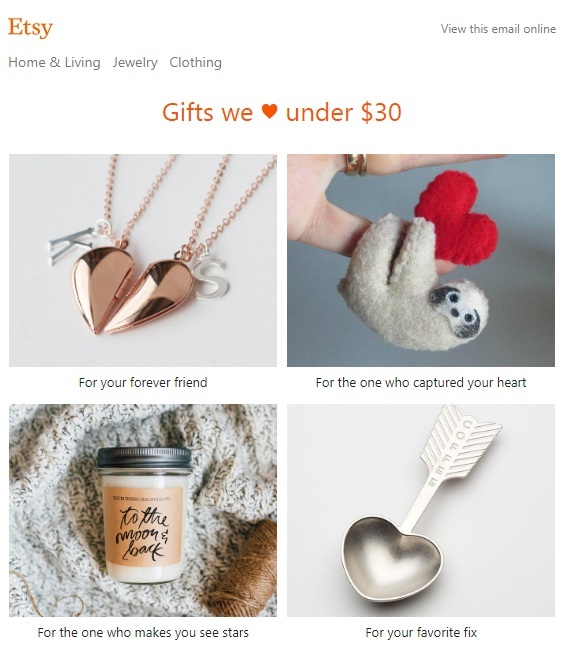 E-commerce platform Etsy sent me a Valentine’s themed email, with gift ideas for under $30. It’s straight-to-the-point and lets the images do the talking. Clicking on any of those options takes you directly to the product pages. A great value deal, with minimal fuss. 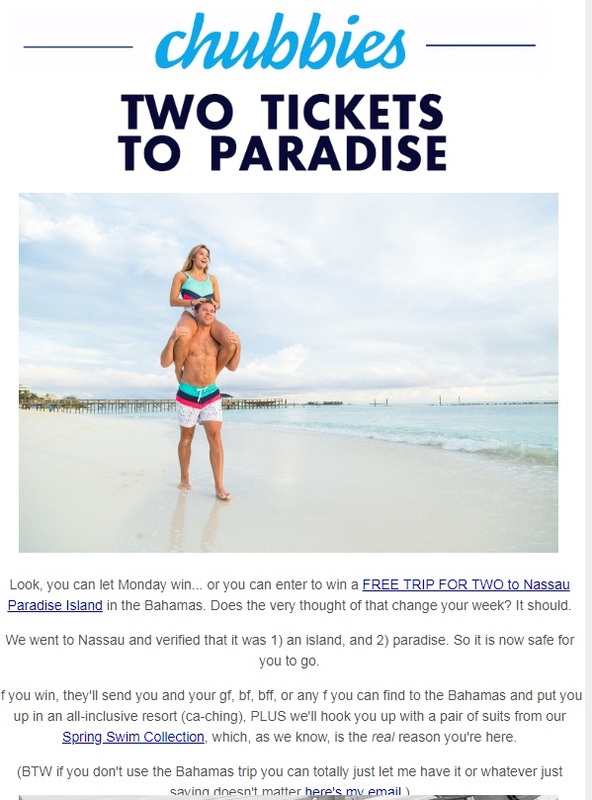 Shorts store Chubbies throws in a prize vacation to the Bahamas for its subscribers. This helps to generate excitement and build the fun reputation the brand enjoys. By encouraging engagement, Chubbies is pushing its subscribers ever closer to converting and making a purchase. 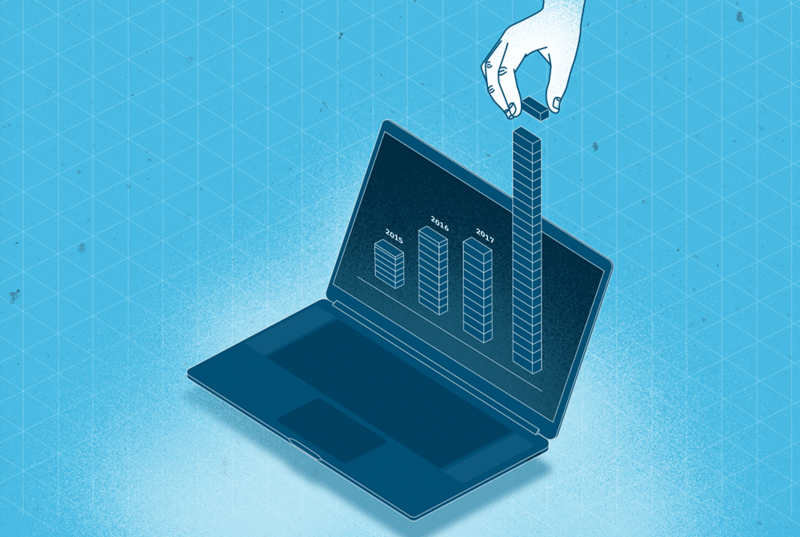 Gaining new customers is only half the job of the email funnel. You should then work on building loyalty. After all, it can cost up to 25 times more to acquire a new customer than it is to retain one. So it makes financial sense to focus on the subscribers who are already in the funnel. The secret is to make the purchasers feel appreciated and not just another customer. You should send out a series of “Thank You” emails after any purchase. Be proactive and check if they have any questions. Be a reassuring presence in their inbox, and provide useful content to help them make the most of your products. 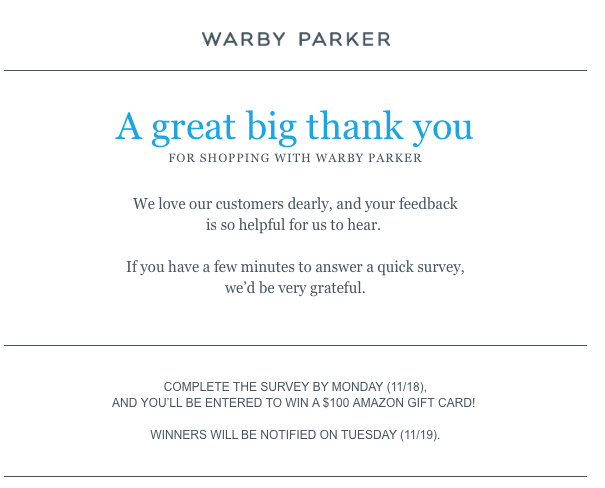 As you can see with this example from Warby Parker, the “Thank You” email doesn’t need to be fancy. The simple tone helps to carry the impression that the brand genuinely cares about its customers. The additional request for feedback is also a good touch. By making the subscriber feel involved in the process, the brand is taking the relationship to another level. One of loyalty. As a business, the onus is on you to keep the relationship active and growing. Keep sending your subscribers product updates, special deals, and exclusive offers.Loyalty is a valuable thing. Earn it. In one sense, securing advocates is a long-term game. It’s a cumulation of excellent customer service, highly engaging emails, and a successful marketing strategy. It’s about treating your customers as individuals rather than just numbers. In terms of email marketing, it means a segmented list of subscribers which enables you to send targeted campaigns. The content of your emails should be tailored to their interests, and keep it up even after they’ve made a purchase.If you’ve covered all those bases, and the loyal subscribers are still engaged with your emails – then they are ready to become advocates. To nudge them in the right direction, invite them to write detailed reviews on your products. This in itself would be a case of advocacy, and a powerful one at that too. A Nielsen Group study showed that 80% of Americans actively seek reviews before making a purchase. Consider following Warby Parker’s example or take a look at how Amazon uses product reviews to its advantage. Leading coffee-shop chain Starbucks offers a reward to both its subscribers and their friends. This win-win approach can be hard for any subscriber to turn down, particularly if they are already loyal to your brand. The tone is also important. The idea that the brand considers its customers as “friends” is a powerful one. Once more, the moment the subscriber has invited their friends, they’ve become advocates of your brand. The email funnel is designed to streamline the process of identifying of your most promising subscribers. The shape of the funnel itself tells its own story. The first step is simple a numbers game. You need to broadcast your brand to as many people as possible. Use all the marketing strategies you have to get your message out there. Once you have the first subscribers on board, you should still take the generic approach. Avoid promoting any products too aggressively at this early stage of your relationship. Continue to send friendly and informative emails to your new audience.It’s only at the conversion stage where you start to focus the content on your products. The subscribers who are still engaged with your emails at this point are clearly interested so you have room to take the relationship to another level. 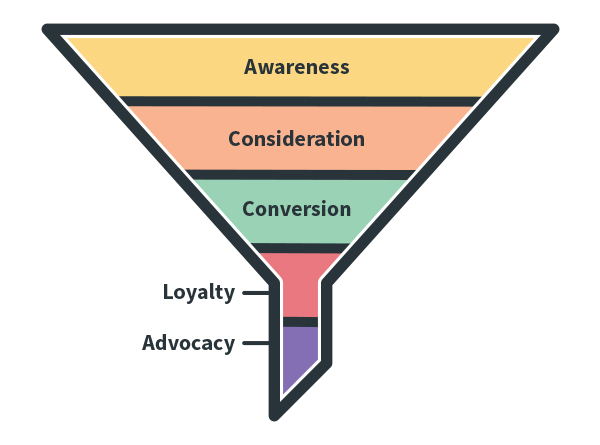 Then the last two stages, loyalty and advocacy, is where the funnel really begins to prove its value. Those subscribers who are still there are your most valuable ones. They will not only spend with your brand but encourage others to do so too,Use the funnel to turn them into your best marketers. Use DirectIQ today to make it happen.